MELISSOS of Samos, son of Ithagenes, was a contemporary of Zeno, though he may have been slightly younger. Parmenides is said to have been his teacher, and it is possible that he may have made the acquaintance of Herakleitos. According to Diogenes, he was a respected statesman, and there seems to be good evidence (Plutarch, Perikles 26, after Aristotle) that he commanded the Samian fleet at its victory over the Athenians, 440 B.C. He wrote a book which later writers refer to under various titles. Literature: The fragments are treated by Brandis, Commen. Eleat. iii. and by Mullach de Melisso X. G. p. 80; Pabst, de Meliss. Fragmentis, Bonn 1889, disputes the authenticity of Fr. 1-5. Spalding, Vindic. philos. Megar. 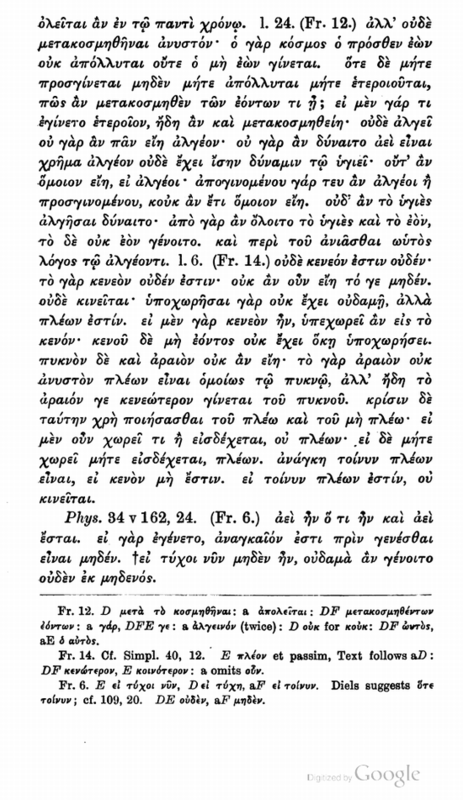 Berlin 1793, first showed that the first two chapters of the book called de Xenophane, Zenone, Gorgia, refer to Melissos. Cf. Also Fr. Kern, Zur Wurdigung des Melissos, Festschrift d. stettin. Stadtgym. 1880. Fr. 1-5. The passage giving these fragments, as they have been called, contains little that is not found in the remaining fragments, and in spite of the fact that it is given as a direct quotation, it seems best to regard it as a condensed statement of the opinions of Melissos. V. Zeller, Vorsokr. Phil. 607, n. 1, and Pabst, de Meliss. Fragmentis, Bonn 1889.
one is always homogeneous [lit. like itself]; and that which is homogeneous could not perish or become greater or change its arrangement or suffer pain or annoyance. If it experienced any of these things it would not be one; for that which is moved with any sort of motion changes something from one thing into something different; but there is nothing else except being, so this will not be moved. (Fr. 5) To follow another line of argument: there is no place void of being, for the void is nothing; but that which is nothing could not exist; so then being is not moved: it is impossible for it to go anywhere, if there is no void. Nor is it possible for it to contract into itself, for in that case different degrees of density would arise, and this is impossible; for it is impossible that the rare should be as full as the dense; but the rare is more empty than the dense, and there is no such thing as emptiness. It is necessary to judge whether being is full or not by its capacity to receive something else; if it will not receive anything it is full; if it will receive something it is not full. Now if the void does not exist, it must of necessity be full; and if this is the case it does not move, not because it is impossible for it to move through space already filled, as we say of bodies, but because all being cannot be moved into being (for there is nothing besides itself), nor can being be moved into not-being, for not-being does not exist. and in itself is always at the end of time, and because of the ever-moving beginning of that which passes, it is always at the beginning, and remains eternal, so that that which has beginning and end in quantity has also beginning and end in time, and the reverse; for that which has beginning and end in time is not everything simultaneously. So he bases his proof on beginning and end in time. Accordingly he says that that which is not everything—i.e. which is not the whole simultaneously—is not without beginning or end; what applies to things that are indivisible and infinite in their being, applies so much the more to pure being; and that all applies to being. Melissos puts it as follows: (Fr. 7) Since then it did not come into being but is, it always was and always will be, and has neither beginning nor end, but is infinite. For if it had come into existence it would have had a beginning (for that which once came into existence would have a beginning) and an end (for that which once came into existence would come to an end); if it neither had a beginning nor came to an end, it always was and always will be; it has not beginning or end; but it is impossible that anything which is not the whole should always exist. . . . . 1. 31. (Fr. 8) But as it always exists, so it is necessary also that it be always infinite in magnitude. 1. 33. (Fr. 15) If being is separated it moves; and that which moves could not exist simultaneously. 1. The paraphrase above (Fr. 3) gives the argument in fuller form. 24; 111, 18. Melissos bringing his previous topic to a conclusion goes on to consider motion. (Fr. 11) So then the all is eternal and infinite and homogeneous; and it could neither perish nor become greater nor change its arrangement nor suffer pain or distress. If it experienced any of these things it would no longer be one; for if it becomes different, it is necessary that being should not be homogeneous, but that which was before must perish, and that which was not must come into existence. If then the all should become different by a single hair in ten thousand years, it would perish in the whole of time. (Fr. 12) And it is impossible for its order to change, for the order existing before does not perish, nor does another which did not exist come into being; and since nothing is added to it or subtracted from it or made different, how could any of the things that are change their order? But if anything became different, its order would already have been changed. (Fr. 13) Nor does it suffer pain, for the all could not be pained; it would be impossible for anything suffering pain always to be; nor does it have power equal to the power of what is healthy. It would not be homogeneous if it suffered pain; it would suffer pain whenever anything was added or taken away, and it would no longer be homogeneous. Nor could what is healthy suffer a pang of pain, for both the healthy and being would perish, and not-being would come into existence. The same reasoning that applies to pain applies also to distress. (Fr. 14) Nor is there any void, for the void is nothing, and that which is nothing could not be. Nor does it move, for it has nowhere to go to, since it is full; for if there were a void it could go into the void, but since there is no void it has nowhere to go to. It could not be rare and dense, for it is not possible for the rare to be as full as the dense, but the rare is already more empty than the dense. This is the test of what is full and what is not full: if it has room for anything, or admits anything into it, it is not full; if it does not have room for anything, or admit anything into it, it is full. If no void exists it must be full; if then it is full it does not move. These are the doctrines of Melissos. 34; 162, 24. (Fr. 6) What was, always was and always will be; for if it had come into existence, it necessarily would have been nothing before it came into existence. If now there were nothing existing, nothing would ever have come into existence from nothing. that are. And earth and rock arise from water. These things then do not harmonise with each other. Though we said that many things are eternal, and have forms and strength, it seems that they all become different and change their character each time they are seen. Evidently we do not see correctly, nor is the appearance of multiplicity correct; for they would not change their character if they were real, but would remain each thing as it seemed, for nothing is nobler than that which is real. But if they change their character, being perishes and not-being comes into existence. So then if a multiplicity of things exist, it is necessary that they should be such as the one is. 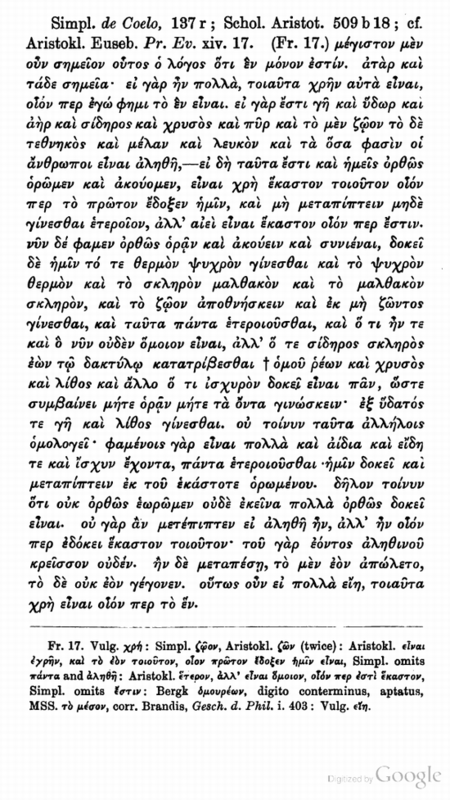 (b) ARISTOTLE'S ACCOUNT OF MELISSOS. Phys. i. 3; 186 a 6. Both Melissos and Parmenides argue fallaciously, and they make false assumptions and their reasonings are not logical; but the argument of Melissos is the more wearisome, for it sets no problem, but granted one strange thing, others follow; and there is no difficulty in this. The error in the reasoning of Melissos is plain, for he thinks that if everything which has come into being has a beginning, he can assume that that which has not come into being does not have a beginning. This, then, is strange, that he should think that everything has a beginning except time, and this does not, and that simple generation has no beginning but change alone begins, as though change as a whole did not come into being. Even if the all is a unity, why then should it not move? Why should not the whole be moved even as a part of it which is a unity, a unity, namely water, is moved in itself? Then why should there not change? It is not possible that being should be one in form, but only in its source. Soph. Elen. 5; 163 b 13. The same is true of syllogisms, as for instance in the case of Melissos' argument that the all is infinite; in this he assumes that the all is not generated (for nothing is generated from not-being), and that that which is generated, is generated from a beginning. If then the all was not generated, it does not have a beginning, so it is infinite. It is not necessary to assent to this, for even if everything which is generated has a beginning, it does not follow that if anything has a beginning it was generated, as a man with a fever is warm, but one who is warm may not have a fever. Soph. Elen. 6; 164 b 35. Or again, as Melissos assumes in his argument that generation and having a beginning are the same thing, or that that which is generated from equals has the same size. The two statements, that what is generated has a beginning, and that what has a beginning is generated, he deems equivalent, so that the generated and the limited are both the same in that they each have a beginning. Because what is generated has a beginning, he postulates that what has a beginning is generated, as though both that which is generated and that which is finite were the same in having a beginning. (c) PASSAGES RELATING TO MELISSOS IN THE DOXOGRAPHISTS. Epiph. adv. Haer. iii. 12; Dox. 590. Melissos of Samos, son of Ithagenes, said that the all is one in kind, but that nothing is fixed in its nature, for all things are potentially destructible. him. For he said in regard to the infinite that the world of those things that appear is limited. i. 7; 303. Melissos and Zeno say that the one is universal, and that it exists alone, eternal, and unlimited. And this unity is necessity [Heeren inserts here the name Empedokles], and the material of which it consists is the four elements, and the forms are love and strife. He calls the elements gods, and the mixture of them the world. And the uniform will be resolved. He thinks that souls are divine, and that pure men who share these things in a pure way are divine. i. 24; 320. Melissos (et al.) deny generation and destruction, because they think that the all is unmoved. Aet. ii. 1; 327. 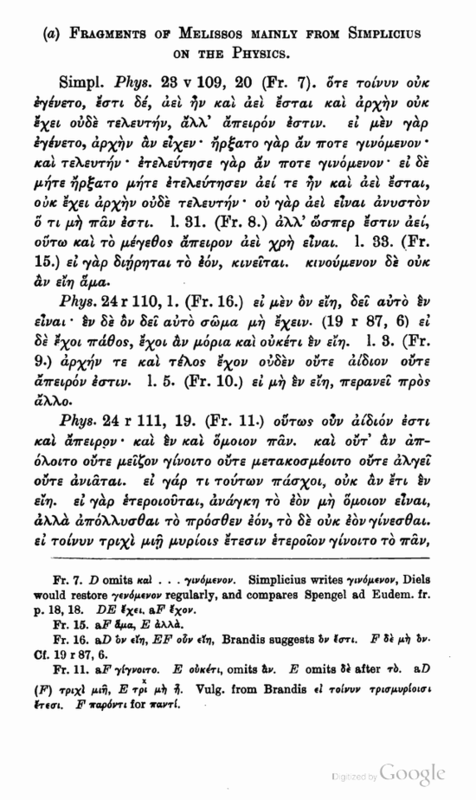 Melissos (et al. ): The universe is one. 328. The all is infinite, but the world is limited. 4; 332. Melissos (et al. ): The world is not generated, not to be destroyed, eternal. Aet. iv. 9; 396. Melissos (et al. ): Sensations are deceptive.